You know what’s terrible for you? Every processed meal you see in the freezer section of your grocery store. I don’t care if it says healthy, natural, low fat, or anything else - they’re expensive and not good for your health. most are high in sodium and full of ingredients you can’t pronounce. Make this on a sunday night, and you won’t have to rush and worry about what you’re bringing to school/work for the rest of the week. 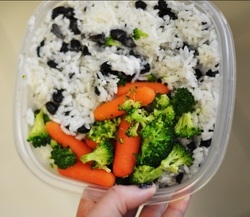 It’s simple: cook up some rice, beans, and quickly steam up a few vegetables. add in different spices in each container to change up your meals. change the food ratios if you need more specific nutrients than others. This might not be a glamorous idea, but it could be life altering to those of you who think eating healthy is too expensive, too time consuming, and not appetizing enough.